SuperOffice CRM software systems are sold to businesses worldwide, and they have a 20 year track record of success in a fast moving industry. Following a corporate acquisition by SuperOffice, part of the integration process was to get two companies to work together. We designed the new offices using a floor plan which was carefully designed to create communication and interaction. SuperOffice is a practitioner of green business principles and wanted these to be reflected in the design of the new offices. Natural materials and themes became the inspiration for different zones. The kitchen is located in the middle of the office plan, but lacked access to natural light. We created artificial skylights in the ceilings, incorporating designs of open skyscrapers. 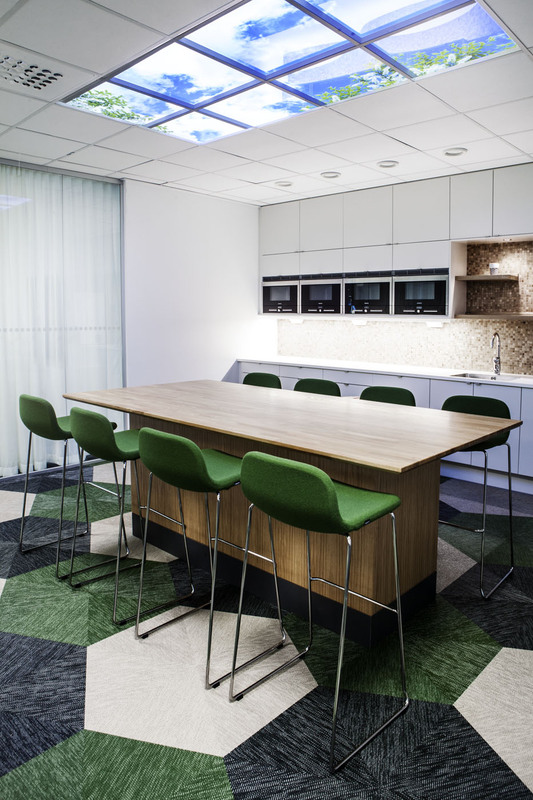 The kitchen area is now the heart of the work space, which binds all departments together.